The “movement” was alive in Copenhagen. 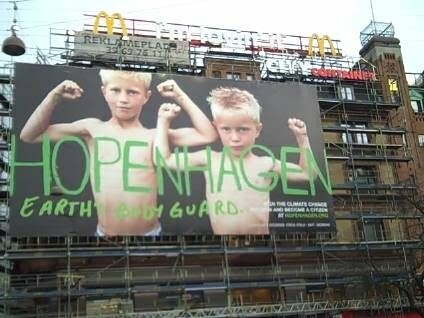 Arriving in Copenhagen one could not help be struck by the message of change everywhere. Every sign in the airport, every billboard, the stickers on C02 neutral taxis, posters related to every aspect of the environmental and social justice movement—movies, concerts, rallies, meetings, symposiums– the sculptures throughout the City— painted globes, giant balloons depicting the volume of a ton of carbon, the powerful image of a thin man carrying a obese figure representing the developed world on his shoulders—a certificate indicating the carbon write-off related to your stay, and bikes available for use at the hotel. My favorite signs each showed a world leader with the date 2020 and the same quote: “I’m sorry! We could have stopped climate change and we didn’t.” Every square and park was jammed with young people, some drumming, others holding teach-ins, some just waiting for the next protest or meeting. People from every part of the world are on the streets, including indigenous people in their traditional attire. It is an Olympics or Super Bowl of environmental activism. 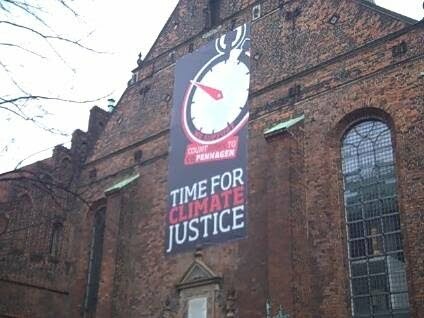 Of course, much of the promotion was related to the COP15, however, there was also ample evidence of Denmark’s higher level of awareness and commitment. First, there are bicycles everywhere—women in fancy dresses and men in suits riding out to dinner in 30 degree weather. There are wide bike lanes on every street. Compared to any other major city I have been in, car traffic was minimal and I don’t recall seeing one SUV. Most bathrooms do not have paper towels. People walking and riding bikes all wait for lights—it is the opposite of New York. Of course, the energy and total attention to climate urgency expressed on the street only magnified the level of pessimism and frustration about what was or was not transpiring at the main event. The gaps between the NGO’s, youth and concerned citizens and the politicians was never more vivid. The gap between the science and the political will was never more glaring. And unfortunately, no group and event happening outside the Bella Center will even scratch the surface of the problem or counter the lack of aggressive action by the governments of the US and China. And so, as is often the case for those of us striding forward in a state of blessed unrest, I felt simultaneous hope and despair. It takes a lot of faith to believe in the collective power of all the committed people working in their own spheres. During my brief stay I had a chance to meet with many dedicated people who are all working in their own way to turn the tide and create a world that works for everyone. 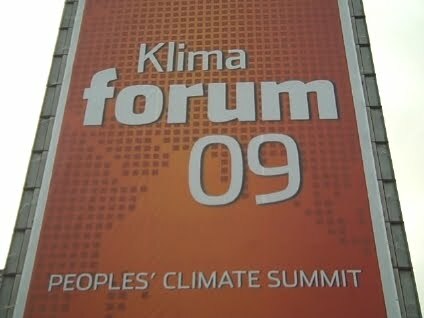 The Klimaforum People’s Climate Summit was alive with exhibits, presentations, and non-stop dialogue between people from around the world. I was particularly struck by the large number of young people who are mobilized in a way that I have not seen since the Vietnam era. I was honored to represent the Pachamama Alliance and the State of the World Forum in a variety of meetings and a televised session on organizational collaboration. It was exciting to unveil the new Pachamama-inspired FourYears.Go campaign with a short, but powerful video. This will be a global media campaign that any organization can use to create a heightened sense of urgency and commitment among their existing or potential members. The campaign is being developed in cooperation with the Pachamama Alliance by the globally recognized ad agency, Weiden + Kennedy. W+K is probably most famous for the creation of Nike’s Just Do It campaign and the Lance Armstrong Livestrong program. World citizen, Michael Olmstead! Nice little tid bits of the commitment that Europe is making toward Climate Change. I like the photo's and descriptions. Now, what is up with our elected officials and those of the “Developed” nations, China and Russia? We seem to be locked in a cold war, waiting for the “other” guy to blink before we actually act> I assume you got a more positive vibe from attending the event. However, the news back home was all politically skewed to represent the Faux News junkies and basically sounded like nothing important could be agreed upon. Nice to hear that you saw good things happening and a strong roots movemment shaping up.